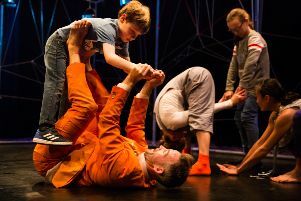 THROUGH 35 years of ground-breaking theatre work with adults with learning disabilities, Lung Ha of Edinburgh has become a world-leading theatre company in its field. Over that time, though, I’ve rarely seen the company find such a perfect fit between artists and material as they achieve in this lushly beautiful 70 minutes of dream-like physical theatre, co-produced with the dance company Curious Seed, and co-directed by Christine Devaney with Lung Ha’s Maria Oller, and Jo Timmins of the Lyra Theatre, Craigmillar. floor-sweepers arrive, interact, and conjure up the small things that, despite everything, bring delight into human lives. There’s a magical musical score composed and performed live by David Paul Jones and Kevin Lennon, featuring lushly lyrical songs, alongside moments of driven tension and wild celebration; there are three professional dancers, and a team of seven inspired young “delight collectors” from the young artists’ group. And above all, there are 17 of Lung Ha’s company members, bringing all their different abilities, intensities and insights to this eccentric and beautiful cavalcade of human life.